In 2014, Julia Wade recorded “The Evidence of Things Unseen” as part of a musical about the story of Jesus’ feeding of the 5000. In this piece, Julia played the character of Mary Magdalene. It’s interesting to note that Julia has had a twenty-year fascination with the life of Mary Magdalene. She’s read many books about her, poured over every mention of her in the Bible and already played her once several years back singing a song of Peter Link’s titled “I Was There.” This experience, for her, was a grand continuation of the exploration of that character. 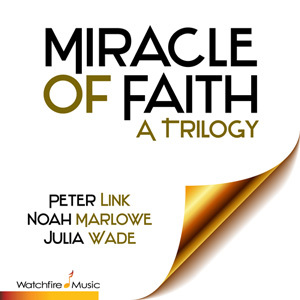 The magnificent songs of Peter Link and the thrilling voice of Julia Wade never fail to inspire. Extraordinary! Beautiful song. Beautiful lyrics. Beautiful concept. I can’t wait for the CD to arrive now so I can hear the whole piece!